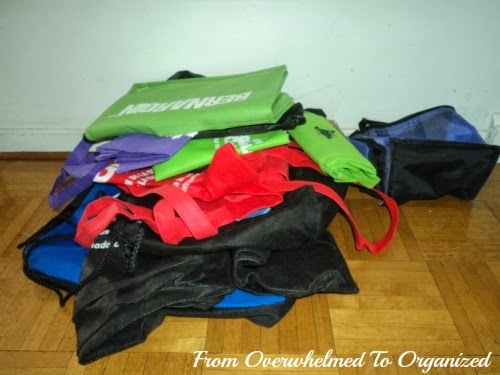 Another area of my home that I decluttered this month was my stash of reusable bags. 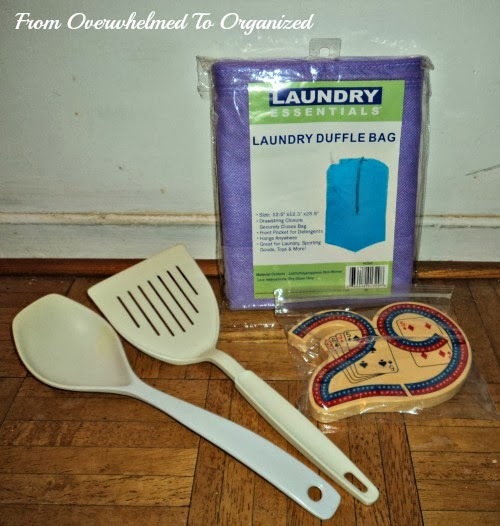 We have a basket by the door of the bags we use most often, but I had a bin in my hall closet full of other bags. I went through it and got rid of most of them since we'd barely touched them since I organized that closet nearly 2 years ago. Felt great! I donated 12 bags and threw out 1 little purple lunch bag since it was cracking and we have others we prefer to use. I donated all these items to Value Village as part of my pick-up last week from the Diabetes Clothesline program. And, I didn't take pictures, but I also dropped off 5 bottles of expired medications to our local pharmacy. I also threw out 1 really old and discoloured pillow and 1 equally ugly pillow protector. Last month I mentioned all the cassettes and other entertainment items that I had purged but that I wasn't counting because they hadn't left my home yet. In the last few weeks I've given away 2 of the cassette drawers, 4 cassettes, 1 correspondence course, 1 portable CD player, 1 CD player case, 2 CD cases, 6 CD's and 1 DVD. And I tossed one old recorded video cassette. I've found someone on Freecycle who would like the cassettes and the last set of cassette drawers, but we haven't arranged a pick-up time yet so I won't count them until they are out of the house. And I'm planning to go to The Beat Goes On soon, so I haven't counted the rest of the CD's and DVD's yet either. 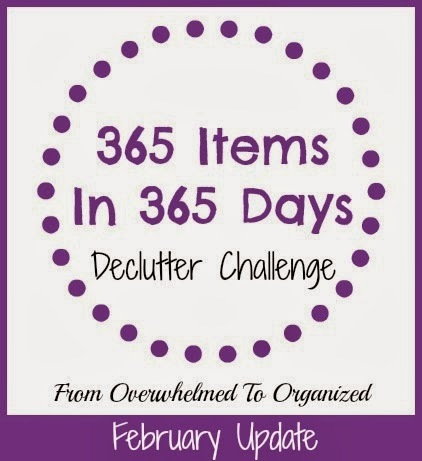 All totaled, that makes 100 items decluttered this month! Which brings my challenge total to 146 items so far! And again, it's mostly just been stuff I come across that we're not using any more. I still have way more to purge, but I'm happy with my progress in these 2 months. 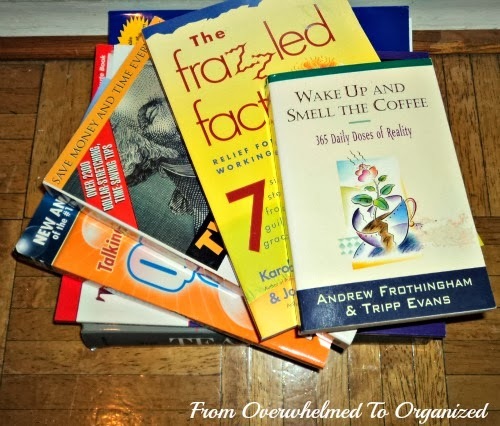 If you're just starting out or you're having trouble decluttering, please don't let my total discourage you... 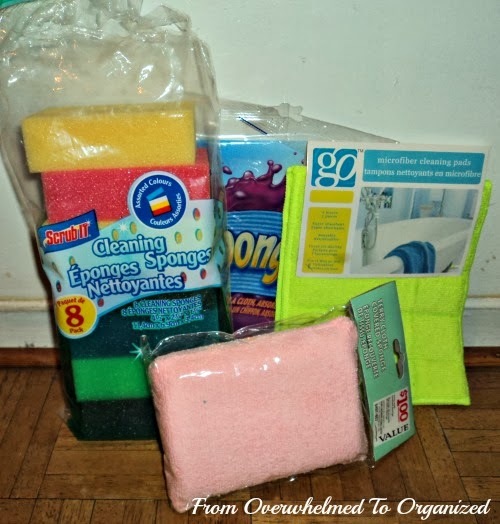 I'm not trying to show off here or anything :) The idea behind me sharing what I'm purging is to show you items that you maybe haven't thought about decluttering, so you can gain control over the clutter in your home! 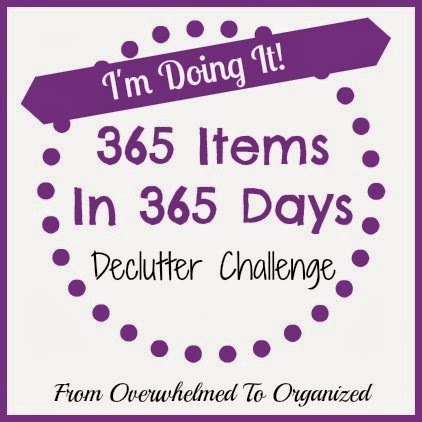 So, that's my decluttering journey so far! 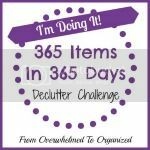 I'm glad you're part of the 365 Items in 365 Days Declutter Challenge and I hope this post gives you some ideas of what you can purge next! If you haven't joined yet... jump in! 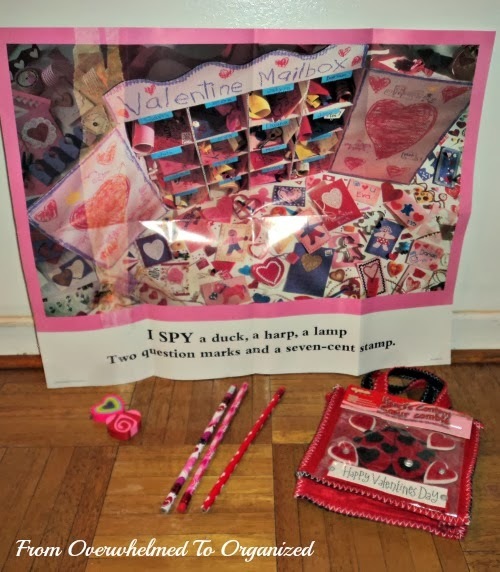 Have you joined the 365 in 365 Challenge yet? 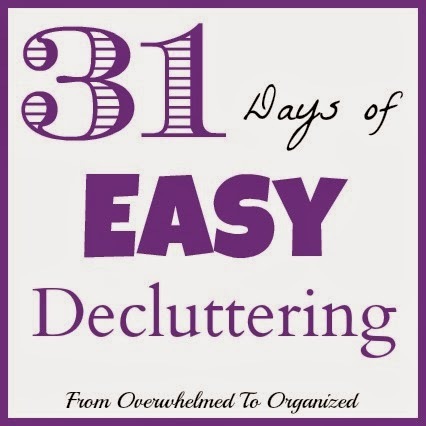 What reasons do you have for decluttering this year? 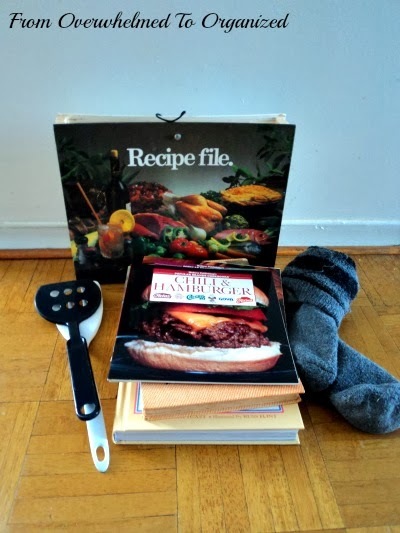 What belongings in your home do you want to purge? 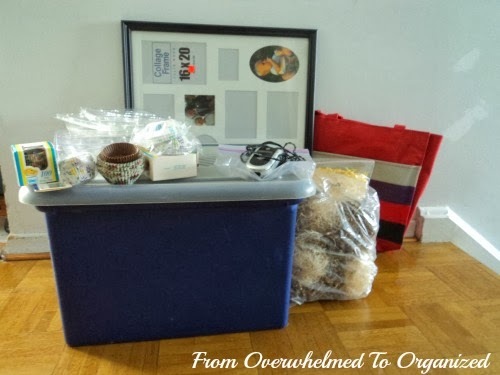 This is some seriously impressive decluttering. I need to get on it. 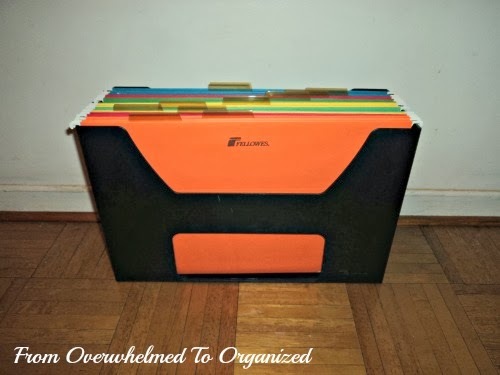 A great purge so far! I especially enjoyed learning about the Phones for Food program. I didn't know a program like this existed, and I have found my old phone I don't need anymore. I was going to throw it into an electronic waste bin but now I know where I can bring it! Thanks!